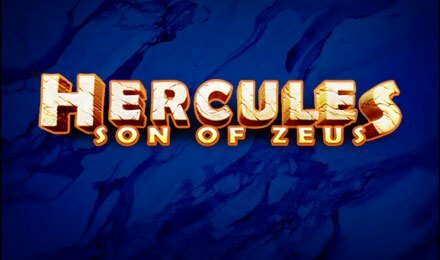 Discover a different era on Hercules Son of Zeus Slot at Moon Games. On this creation of Pragmatic Play, discover more about the mighty god named Hercules, who is said to be the son of Zeus as per Greek mythology. The game is made up of 5 reels and 50 paylines and is set against the entrance of a Greek temple, with 2 pillars on each side. The reels are set right in the centre in a blue colour. They are full of symbols like Hercules and different animal/god representations in red, blue, green, brown and purple. Playing card symbols like A, K, Q and J are also available. Make the most of this slot on a mobile or desktop device at Moon Games! Start by clicking the + and – buttons on the Coin Value display to select your preferred betting amount on Hercules Son of Zeus Slot. You can also choose 1 to 10 coins per line. Once done, click on the Spin button. With combinations of 3 or more matching symbols, you can trigger a win. With the Auto Play option, enjoy 10, 20, 30, 50, 70 and 100 games played automatically. It can also be stopped on any win, if a feature is won, if a single win exceeds a given value or if cash increases/decreases by a given amount. Zeus’ Temple on Hercules Son of Zeus Slot is the Wild card which replaces any symbols in winning combinations, except for Scatter. As for Scatter, it is represented by Zeus and helps generate the Free Spins Round. Land 3 scattered Zeus symbols on reels 2, 3 and 4 to earn 6 initial free spins. During the feature, one Wild symbol is added to reels 2, 3 or 4 and stays in place until there are no more spins. Each Scatter appearing during the round triggers 1 extra free spin. There is no limit to the number of free spins you can earn. Don’t wait anymore! Play Hercules Son of Zeus Slot at Moon Games to have a wonderful time. Good luck to you!